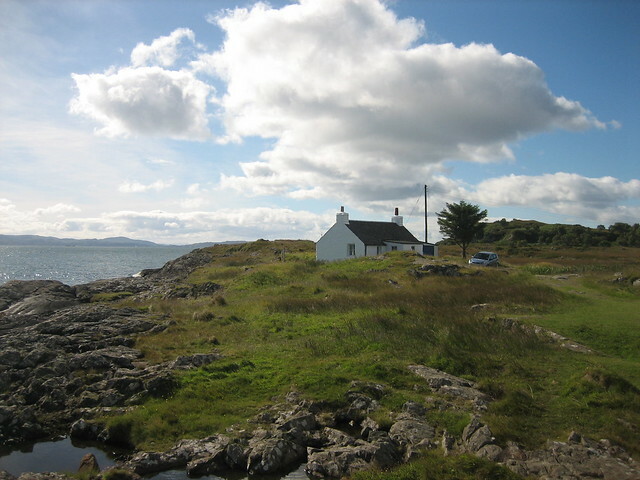 Situated on a peninsular in the north west of the Isle of Mull, Grasspoint cottage is where we spent a week of our Honeymoon in September 2007, with a view of the sea out of every window and hardly a soul in sight it makes for a perfect romantic getaway. The cottage is basic but has everything you could need , the wood burning stove let us make it nice and cosy in the evenings and when the Scottish weather wasn’t so nice. Whilst we we’re there we had 2 days of sunshine and the rest of the week there was an atmospheric grey drizzle, just like i’d imagine Scotland would be. The cottage was 2 miles from the main road that runs around the whole of mull, and Tobermory was another 45minutes along the one lane road (you had to pay careful attention or you’d find yourself heading straight for a land rover of bus) – so we had to make sure we stocked up well when we left co-op. Grasspoint was a haven for wildlife, the guest book mentioned all sorts of sightings. After reading about the possibility of watching an otter swim by we spent a few evenings sitting on the craggy rocks staring hopefully at the horizon. In the end we had two otter sightings, excellent. Grasspoint was obviously one of the best spots on the whole of the Isle of Mull for wildlife, every day a land rover would park up nearby and twitchers would pile out with their giant telescopic lenses. Being a very old, and isolated cottage, everything drained into the sea. One twitcher was given quite a fright when the toilet was flushed past them as they were intently watching for wildlife. Grasspoint cottage cost £300 for the first week of September, it sleeps 2. One of the most incredible places ever stayed. The views are stunning and the air is so pure, deffinatley worth visiting for a long weekend or for a few days. Scotland is a spectacular place with stunning views, rolling hills and remote peace. Although it can feel isolated, the cottages and accommodation are really cosy! It looks like a really lovely place.